This book along with Along for the Ride by Sarah Dessen and Unraveling by Elizabeth Norris sat on my shelf for months. I had bought this one months ago--sometime in the spring, I think--deciding that I would read it soon, but then it just sat there as a gazillion other good-looking books came my way. I guess I must have ADD with books because it seems as if my attention to one unread book is blinded once I find another shiny book. I really should stick to some type of list or something. When I first picked up this book, I wasn't sure what exactly to expect. The cover jacket didn't give me much to go on (it's not like the Goodreads synopsis) and I was just kind of relying on the recommendations from others. Yes, so in all, I was taking a huge jump of faith for this book. Though it's not like I haven't done something like this before. Good thing I liked this book. Violet Eden is like any normal shy girl. She's determined with her studies and sticks to her goals and she also has a deep crush on her closest guy-friend, Lincoln, who just want to be Friends while Violet wants to be all over his hotness. I guess girls can't have everything, right? Then, she finds out that she's some type of half-Grigori person and things just kind of spiral from there. That's also when I decided that I didn't like how unforgiving she was. And then Phoenix got into the picture. Yes he's absolutely gorgeous and has this amazing head of hair, but he should not have been there, in my opinion. It's not that I didn't like his character because I kind of did in that he's-a-bad-boy-but-am-strangely-attracted-to way. He was temptation waiting for Violet to take hold of. He didn't make my eyes boggle like Daemon Black from Obsidian did, but Phoenix certainly had his moments. So here's the catch: I DO NOT LIKE LOVE TRIANGLES. They drive me insane and usually I blame it on the MC for leading two guys on at once. I do not like them or enjoy them and I don't think I ever will. I didn't like it in Twilight and I will not like them now. Sadly, this book has a love triangle and that made me sad. Most of the time, I want to pull my hair out and scream when it comes to love triangles. Whatever happened to relationships just being platonic? Nope. That doesn't happen. Only upside to love triangles I'd say is that there is plenty of drama that leads to one person getting all sad and lonely and passion. *waggles eyebrows* You know what I'm talking about. Just think about it and you'll know I'm right. I really like Jessica Shirvington's take on angel mythology in this book. It really was unique and makes for a really great read. Instead of it being religious in the sense that God banished angels from Heaven and Hell was created with Lucifer, she came up with a different idea where there's different dimensions and such, which I thought was cool. And there also wasn't just a good side and the bad side, black and white. There was that grey area, instead, where people weren't always what they seemed and it wasn't all about good versus bad. In my opinion, I thought this was a more accurate take on reality now, thus making this book a good mind bender a bit. Overall, I gave this book four out of five stars. 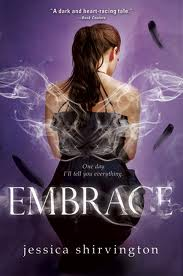 I cannot wait to read the next book in the series, Entice, which is scheduled to come out soon. I think it is such a great idea for a book and I enjoyed all of the action and angel mischief in it.